My background: I am 5’7?, 190 lbs (give or take). I am a bicycle commuter that travels 34 miles round trip and I am also an avid….make that an ADDICTED mountain biker. Testing Grounds: Fullerton Loop and the Streets of Orange County Ca. For riders inclined to take on the most rugged of gravity-challenged terrain, the IBEX Alpine 550 provides the cutting-edge stopping power that only disc brakes can provide. Combine that with an ultra-reliable Shimano Alivio drivetrain (including an upgrade to Deore on the rear derailleur), prime 6061 tubing, and a Manitou Trace Elite suspension fork, and you have one of the most complete mountain bikes ever made. The meticulous craftsmanship of the IBEX Alpine 550 will hold its own against hardtails that cost hundreds more. For a very reasonable investment, you can have a top-quality disc brake mountain bike primed and ready for the roughest rides. Check out the specs and you’ll see the close attention paid to every detail. 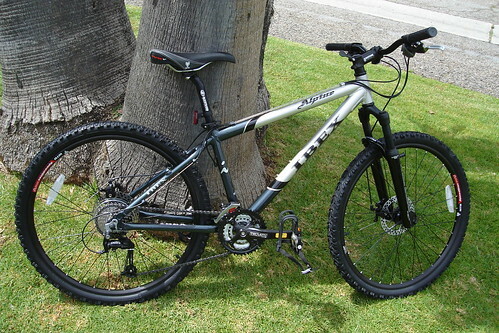 If you have your heart set on an MTB you can love… at a price you can live with, the Alpine 550 has it all! First Impressions and Comments: At first glance the Alpine 550 looks more than capable in doing well in a commute and on the trail. The bike is laced with some premium parts with names like Shimano Deore, Manitou, Kenda, Tektro and much more. The Alpine 550 is very light weighing in about 29.3lbs. The geometry is very comfortable for long distance commuting as well as epic riding on the toughest trails. Amazing braking power, stops on a dime! Weaknesses: During our testing period, we did not experience any issues with the Alpine 550. In fact this bike has been very reliable since day one. Basic derailleur tuning was needed after the cables stretched, but other than that, they shifted with accuracy each time I fired away on the Alivio shifters. Summary: The Alpine 550 is absolutely a brilliant piece of machinery. Ibex knew exactly what they were doing when they combined the components to create a nearly perfect bicycle for mountain riding and commuting. I say nearly perfect only because they have one flaw, they didn’t have it available in a pink color. But that’s ok! The Alpine 550 has to be the best value in hardtail mountain bikes that is available out there. I haven’t come across any other bike that performs as well as the Alpine 550 and cost as less. The Ibex Alpine 550 performs great in the streets and the trails. Pot holes are no match for the large Kenda Koyote – 26″ x 1.95, along with the help of the Manitou Trace, they roll right over and through any obstacles that comes in your way. Stopping power on the Alpine 550 is unbelievable, it literally can stop on a dime, no brake squeal, no fatigue experienced while squeezing the levers. On the trails the Alpine 550 is like a beast waiting to be unleashed. Just point and shoot, the bike will tackle anything in its path, it will climb the toughest hills and heck, it will even help you get away from a rattlesnake. Like I have mentioned before, shifting was supreme. I have to say it has to be the best feature on this bike. 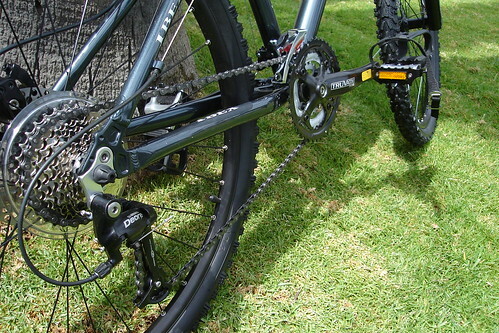 The combination of Alivio shifters, front derailleur and Deore rear derailluer makes this bike easy to ride and manage on any trail whether on the pavement or through a single track. Would I recommend it? Yes! I absolutely LOVE the Ibex Alpine 550. I loved it so much that I even used it in all of the bike contests we had on the commutebybike.com 1 Year Anniversary Picnic…and I won all the events on the Alpine 550. Check it out below. I was fortunate enough to ride this bike at the CBB picnic and it really was great. One word…Impressive. I would get it if only they had it in pink!